Neck and shoulder pain is incredibly common and responds very well to osteopathic treatment. That is because neck and shoulder pains are often caused by poor sitting posture which cause the spine to become stiff and immobile. 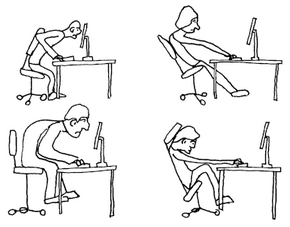 If you sit at the computer for much of your day (or even worse your laptop) you might end up sitting like this. You may also have noticed that your neck and shoulders feel tight and sore at the end of the day. The reason for this is simple. Your muscles are exhausted from trying to maintain your head in a less than optimal position. Another common cause of neck and shoulder problems relate to your standing posture. Your brain always tries to maintain the sensory organs (eyes, nose ears) level with the horizon. So, if you stand crookedly ie more on one leg, or with your hip out to one side (parents who hold their kids on their hip take note), your neck is the final part of the spine capable of adjusting position for your head. Osteopathic treatment can address all these problems, because we take a whole body approach to treatment and address all the issues contributing to the symptomatic area – not just the bit that hurts. By treating the sore muscles and stiff joints we can make you feel significantly better pretty quickly. We can then work on your posture and exercises to help you maintain those benefits and stop the problems from coming back.